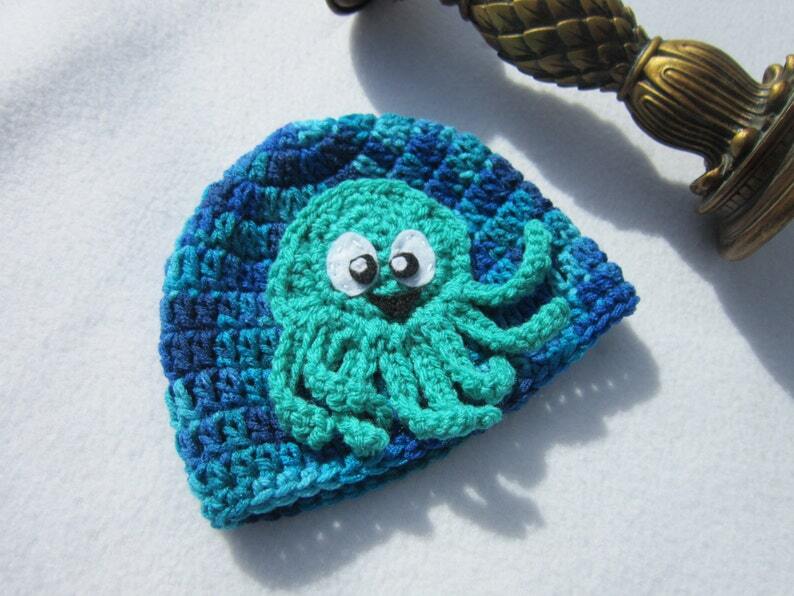 This shades of blue hat with octopus is adorable. I've crocheted this from some varigated yarn in many shades of blue and added an octopus applique that was also crocheted for cuteness. This hat would be perfect for summer or spring pictures. Buy two or more, they would be great for triplets or twins. If you prefer your octopus in pink or another color, just let me know in the note to seller. The octopus's eyes and mouth are made from felt and sewed on. This hat can be made in any of the sizes offered. Please let me know the age of the child if you order a child's size. Please hand wash this hat and lay it flat to dry. It is stretchy, but please measure to make sure it will fit your little one. What a great shower gift this would make for a co-worker or friend. Or you know someone having a baby or babies this spring. Order one of more for them. Great photo opportunity for a photographer as well. Wear this hat to the beach and people will be sure to say, "Hey, you have an octopus on your head!" Your hat(s) will be made and shipped approximately 2 to 3 days after your order is complete. What a perfect little hat to wear for fun! Need something for you or your home? Take a look in my shop. It's never too early to start Christmas shopping either!